Posted on February 22, 2008 by Chad O. First off, the official ThinkPad X300 page (or at least an official “about” page) is now online. 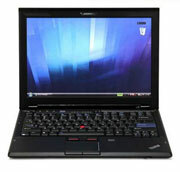 Avram Piltch over on the LAPTOP Magazine blog has posted an article, ThinkPad Design: Classic or Classless?, where he talks about being surprised by some user comments: I think of ThinkPad as the Rolls Royce of laptop design, elegant and timeless. So today, I was surprised when I saw how many users say the ThinkPad designâ€™s time has come and gone. Also over at the LAPTOP Magazine blog, a Video Hands-On was posted yesterday. The Crave gadget blog has posted a small photo gallery of the X300. Finally, Andrew over at NotebookReview has posted his first impressions of the ThinkPad X300, saying right now it’s a big thumbs up on this piece of engineering from the ThinkPad labs. They’ve also posted several videos and photographs of the X300 in action. This entry was posted in Articles, Lenovo, Reviews. Bookmark the permalink.